Ugh, I can’t believe I didn’t even manage one post per month in the last couple of months. This has been a dry, dry crafting spell (how can a baby sweater take so long?! I’ve been knitting the same gift for months now) but I finally have something to show off here! You may recall that I’ve been pining after the patterns in the Colette Sewing Handbook since January, and I finally got around to making one of them. Check it out. Fabric: Kokka Ladybug Mushrooms 100% cotton (43 inches wide), 1 yard (!) snagged on a 40% off sale from Purl Soho–cost: $11.40; plus some leftover scraps of quilting cotton from Jo-Ann for the facings. Last fall, as a result of me speculating on Twitter about a Woot! deal on a serger, chemgrrl’s awesome mom sent me her old serger in an amazing random act of kindness, a Bernette 43! I just had to take it in to get it tuned up. I then kept putting off using it because I was intimidated by it, wanted to take a serger class, and never seemed to time it right with the schedules for the sewing stores in the area. Eventually, though, I decided I’d just give it a shot by following along with the book and manual and Googling for the rest–this is what I did with knitting and it worked out fine–and lo, all was well! (I still haven’t had to rethread it from scratch, and I still haven’t washed anything I’ve serged with it to see if it disintegrates, so this may yet prove to be a statement of Extreme Hubris, but it worked like a dream and was much less scary than I had anticipated.) Thank you again, Joyce! 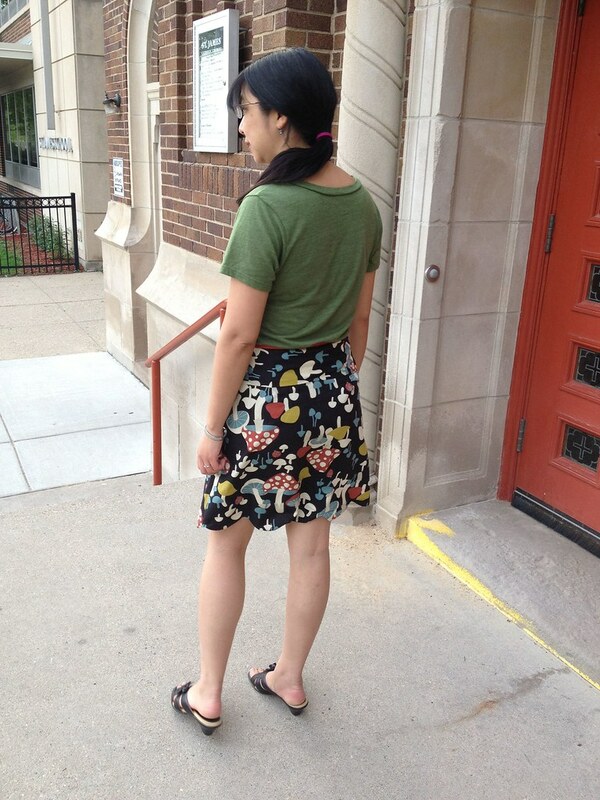 Anyway, long story short, I put together a lot of this skirt with the serger. 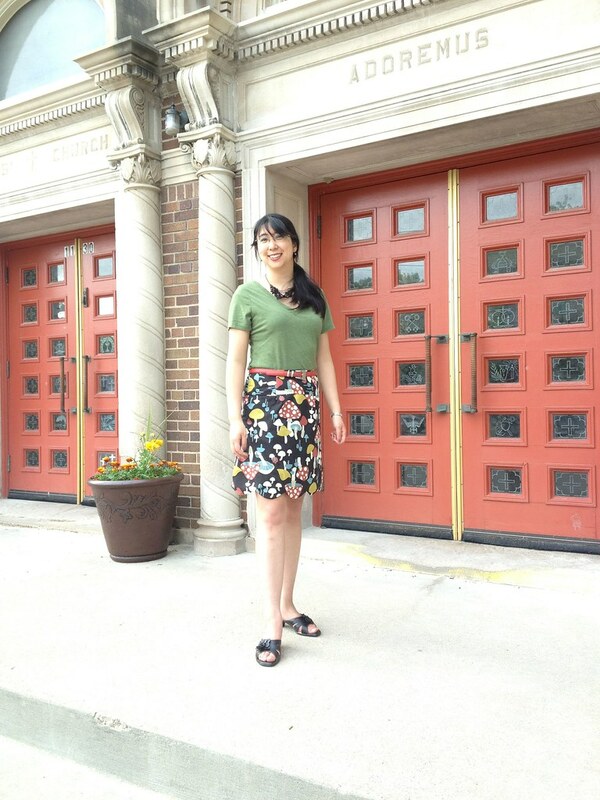 This is not the first garment I sewed with the serger–I have another post planned for that–but I used it to do a good part of the seaming and to finish all the edges. 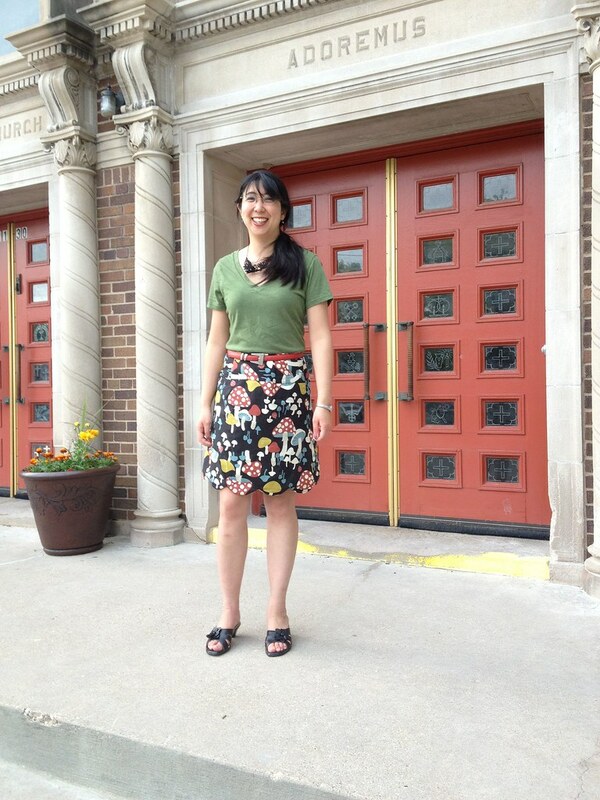 Verdict: I LOVE this skirt and want to make about 10 more of them in all different colors! The entire time I was working on this, I was concerned about the sizing, because it seemed terribly small as I was putting it together and holding it up against myself, but as it turns out, it fits perfectly! I’ve had a lot of heartbreaks involving making pieces of sewn clothing that turn out to be an inch or two too small, but this was great. I went as far as just basting the darts at first instead of sewing them the proper way because I was so sure I’d have to rip them out to give myself more room in the hips and waist, but the skirt is perfectly comfortable as is. I cut the facings out of scraps of yellow quilting cotton (no idea how much–a quarter yard, maybe?) I also cut out pocket pieces, intending to put them in at the side seams, and then completely forgot to do it and serged together the side seam on the side that would have had a pocket in it, and put a zipper in the other side following the pattern construction, so I’ve set aside those pocket pieces for some future project. I serged all the edges that would be left raw (facing edges, fabric edges) and serged the seams on the left-hand and for the facing construction. The darts, right-hand side seam (where the invisible zipper is), and hem were constructed using the standard sewing machine. I drew a stitching line to follow on the facing with disappearing ink, and stitched slowly and carefully, then (following the advice on this page) trimmed the seam allowances on the rounded parts of the scallops to about 1/4 inch width, and notched almost to the seamline at the pivot points of each scallop. In addition to understitching the top facing, I hand-stitched the facings to the shell fabric afterwards to keep them in place. The pattern was well drafted (for me, anyway) and easy to follow–no complaints! Plus it’s versatile–the scalloped hem could easily be replaced with a straight one for a nice basic A-line skirt pattern. I liked the treatment of the facing around the zipper area–you stitch it down vertically along the zipper as well as around the top, and it makes for a very nice finish. Something I found freeing with this project was giving myself permission to cut the pattern directly out of the tissue paper it was printed on. I usually try to avoid doing this, and prefer tracing off expensive patterns like Colette patterns onto a separate piece of paper to leave the originals intact in case I ever need to use them again in a larger size (e.g. if I do my initial fitting wrong), but I got out my tracing paper this time and asked myself why I was going to bother with the extra hassle and expense of tracing and cutting from a separate piece of paper. If I needed a larger size, I decided I would just use the tracing paper to modify the pattern I had already cut out. So I cut it out, threw out all the scrap tissue paper, and felt suddenly liberated. So much time saved! And, as it turned out, it worked out just fine. Next time I make this, I might cut the back in two pieces (with extra seam allowance added to each) in order to put in a zipper at center back, and hence side seam pockets on either side. And I would definitely try to get enough fabric that I could cut the pieces with the intended cutting layout instead of my kluged-together crosswise yokes. Oh–and I didn’t interface the facings as the pattern asks you to do. That would probably be a good thing to do next time as well. Next up, though, I think I’m going to try a Truffle dress with some of the other Japanese fabric I got from Purl. (A birthday gift, courtesy of my dad and stepmom–thanks, guys!) I intend to sew the bodice lining first as a kind of muslin, make any tweaks and re-sew the lining if necessary, then use it as a template to cut the fashion fabric. As an aside: Rahul is really into mushrooms and I knew he would love the Amanita muscaria mushrooms featured on this print. After taking these photos of the skirt on Friday, we went out hunting mushrooms on Saturday and found the biggest morel I’ve ever seen in my life in the woods! I was so excited until our friend told us that EVERY stall at the farmer’s market this weekend (which we missed) had enormous morels for sale and we could have gotten a huge pile of them there. Oh well–at least ours was free, and wild-foraged! We sauteed the morels in garlic butter, and they were delicious.